Taxi Websites is a London based web design company committed to creating websites for TAXI community. 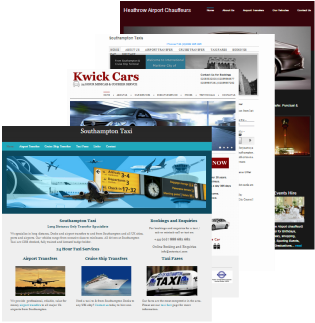 Having extensive knowledge and experience of designing websites for taxi hire & minicabs companies across UK, we are the leading providers of quality and affordable websites particularly aimed at long distance jobs and airport transfers. All our websites are focused & are designed to do the job i.e. to bring more enquiries and bookings for your business. Why not have a look at our portfolio and feel free to contact us to discuss your requirements? A taxi website does not have to cost a fortune. Special Offer: Get a professional taxi website designed by us for only £250. Contact us today to know how our economy web design package can help you expand your revenues. Have a look at our recently designed websites for taxi companies based in London, Essex, Surrey, Winchester, Southampton, New Forest and Scotland.